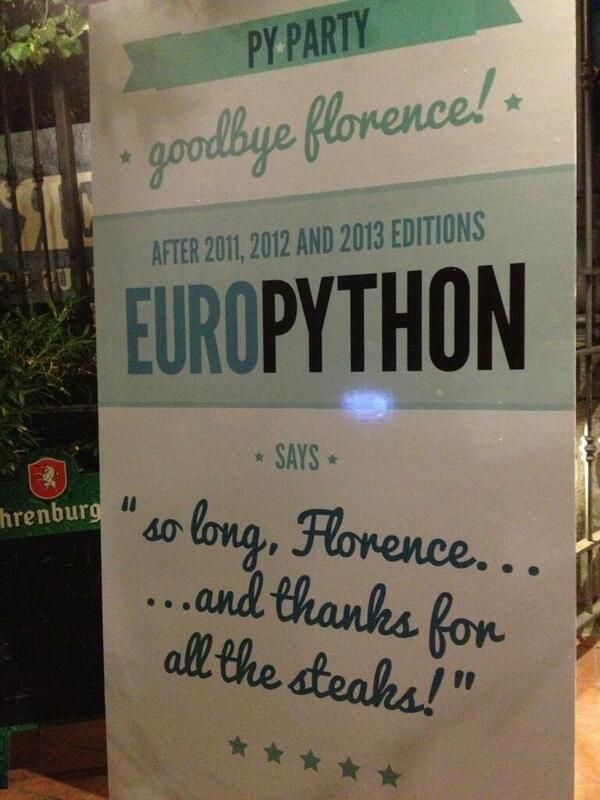 It is now time to say goodbye to Florence, the city that hosted EuroPython 2013. I would like to tip my hat to the PyCon Italia team for putting on such a fantastic conference. 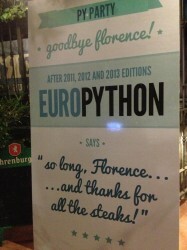 EuroPython has been hosted in Florence three years in a row now, with this year being the biggest and best – in my opinion – of the seven EuroPythons that I have had the pleasure of attending. EuroPython has always been the conference to attend if you would like to learn of new technologies, tricks and libraries in the Python community through the varied talks that are on offer. Most of the talks are practical in nature, giving you an overview of how to employ a library or system, or how a particular technical challenge was addressed. Personally, I will be using material I learned in the talks on password handling (T. Waldman) and ElasticSearch (D. Matthews), while I found the talks on the use of IPython in the classroom (A. Lehman), static analysis (D. Jemerov) and machine learning (S. Shankar) to be informative and interesting. The talks were chosen by a community voting process that took place online via the http://europython.eu website. As a consequence, talks that have practical value and present information of interest to the Python community will do well here. I submitted a talk myself, which was ultimately – and understandably – rejected due to being oriented towards pure research. The talks that made the cut covered a very wide variety of topics, ranging from web development to augmented reality, from security to education. Besides the talks, the hallway track gave everyone the opportunity to meet and socialise over coffee. For the past three EuroPythons this has been excellent Italian espresso that I will miss sorely now that I am on my way home. Many attendees – myself included – consider the hallway track to be one of the most valuable parts of a conference, as you can discuss material more directly related to your own work with fellow Pythonistas. It’s also the place to meet potential employers, collaborators or business partners (probably the best place in Europe for such meetings, come to think of it). It is always a pleasure to make new friends and go to dinner with them in the evenings. It’s all done now so – sadly – it’s time to say good bye to Florence after three fantastic years. Next year its ‘Guten Tag Berlin!’ I am excited to experience EuroPython in a new location and venue in 2014, and I hope you can join us! I am currently a research associate / assistant tutor at the University of East Anglia, where I work on a historical document management system. I have been an avid Python programmer since 2005. My interests centre around programming tools and 3D graphics. I am the author of the gSculpt 3D modelling program and ‘The Larch Environment‘, a software development environment research project. I can’t +1 this enough. Very good writeup of an excellent EuroPython in an awesome city. I met wonderful people, I learned some new tricks, got some inspiration for exciting new projects, and got to drink amazing coffee. See you over a bratwurst and weißbier in Berlin!